Cortec VpCI-391 is a water-borne, temporary coating that is intended for medium to long-term indoor and outdoor protection. Once dried, VpCI-391 builds a non-tacky transparent film on the metal surface that provides excellent salt, humidity, and UV resistance. APPLICATION:VpCI-391 is recommended for metal surfaces as a protective coating when a non-tacky surface is required and when optimal removability is beneficial. 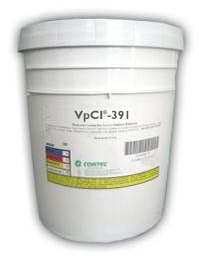 VpCI-391 can be applied by spraying, rolling, brushing, or dipping. Available in 5 gallon pails (Cortec Product Code 12302540) or 55 gallon drums (Cortec Product Code 12302539). 5 gallon pail weighs 50 pounds and ships under our standard shipping rates. The 55 gallon drum must be shipped by truck. We will provide you with a freight quote before we ship this product. Do not allow product to freeze.